If you're a music fan—or a fan of Guitar Hero—chances are good you're familiar with the iconic look of Gibson's Flying V guitar. What you might not know, however, is that the Flying V is only one of a trio of futuristic guitars designed in the late 1950s by Gibson president Ted McCarty. Click through for the story of the Flying V, the Explorer, and the Moderne, plus a peek at their patent drawings. Dealers would buy new Flying V's, but then they'd hang them in the windows just to attract attention. Some of them never tried to sell the thing; they were just too radical. I wish I had kept one each of the original models. I hear they are really highly prized these days. 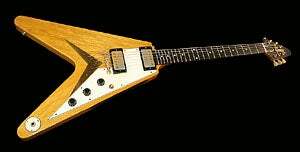 They are indeed; a 1959 Flying V like the one pictured up front is valued at over $120,000. You can check out more pix here.